Back to; Installing HID Headlights in a 2011 Silverado step by step instructions. 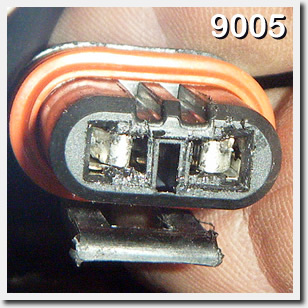 Here is a photo of the 9005 headlight connector on the Silverado high beam headlights. This image illustrates the configuration of the plug for the high beam lights. This connector hooks the trucks electrical system to the ballast for the HID headlights.